Prince William is coming to RAF Coningsby on July 11. The Duke of Cambridge, Patron of the Battle of Britain Memorial Flight, will attend a reception and air display to mark the Flight’s 60th Anniversary. The Duke will meet veterans who flew and worked on RAF aircraft during the Second World War. They will join together in front of the Flight’s historic aircraft for a group photo on the airfield. The Flight was formed on 11 July 1957 by Group Captain Peter Thompson, a former Battle of Britain Hurricane pilot who was then Station Commander at Biggin Hill, Kent. Group Captain Thompson came to realise that many of the iconic planes that flew in the Battle of Britain were falling out of service. He felt the best way to honour the RAF’s victory was to ensure they could preserve examples of the principal aircraft involved – the Hurricane and Spitfire. He set about collecting the nucleus of what is now the Battle of Britain Memorial Flight. Group Captain Thompson began the ‘Historic Aircraft Flight’ with Hurricane LF363, and three photo reconnaissance Spitfire PR.Mk 19s – PM631, PS853, and PS915. These Spitfires were marked for retirement and grounding and required considerable engine repair before they were fit for the move to Biggin Hill. The three machines were flown from Duxford to Biggin Hill as a three ship formation on 11 July 1957, the day of the Flight’s founding. Three of those four aircraft are still with the Flight, which today has 12 historic aircraft, comprising of a Lancaster, a Dakota, six Spitfires and two Hurricanes, plus two Chipmunks used for training. Sixty years on, the Battle of Britain Memorial Flight’s historic aircrafts are maintained and flown to the same exacting standards as the most modern aircraft in the Royal Air Force. The BBMF has displayed or flown past at thousands of events, ranging from State occasions and major commemorations to village fetes. It has become a living tribute of the Nation’s respect for all those who have served with the Royal Air Force across the generations; especially those who have lost their lives fighting to preserve the freedom of others. The Flight’s home is Royal Air Force Coningsby, where today’s event will take place. 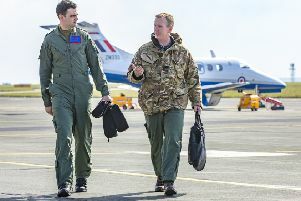 The Duke of Cambridge, who completed his service in the Armed Forces with a Tour with the Royal Air Force Search and Rescue Force at RAF Valley, Anglesey, is Honorary Air Commandant of RAF Coninsgby.